New to Contentful and want to learn how to master creating and publishing content? Or maybe you’ve been using Contentful for a while but would like to learn some tips and tricks? Nice work. To help you on your way, we’ve put together 8 tips to streamline your workflow, increase your productivity and make formatting less of a chore. While you’re writing or creating an entry, Contentful takes multiple snapshots of your work. We refer to it as “entry versioning” and it is a really helpful tool for editors who need to compare published entries, track changes to the entry or restore content to a previous version. Perhaps your copy editor was overzealous, or you accidentally hit the delete button with your elbow – it happens! Every time you hit publish or publish changes, Contentful creates a version of your work in the grey sidebar on your left-hand side. To start a side-by-side comparison, simply select the versions you would like to compare. If you’re working with content that needs to be available in multiple languages, your developers can help you set up locales. You can have as many locales as you need and once setup is completed, it’s simply a matter of selecting/deselecting which locales you need for the entry in the right-hand side bar. For example, if your writing is written in English and translated to French, you simply click change under translation and select French. You’ll notice it gives you another field which your translator can use. For more on localization, or if you would like to introduce the idea to your developers, you can read about it here. When you’ve built up a significant content library, you’ll find yourself needing a way to quickly search through content. You could waste time scrolling endlessly, or you can get familiar with all of the ways to sort and search through your content. Your search bar’s most basic function allows you to categorize by content types and to type in keywords. For a more refined search, you can click on filter and add in over a dozen more parameters. Some you might find helpful are updated by, published by and ID. For example, if you’ want to find out what posts were published in January, you can click on published at and choose a date range. Send in a ticket through our support portal. This is easily available through the drop down in the top right-hand corner of the web app. Chat with us live and directly from the web app. Simply click Talk to Us in the drop down on the top right-hand corner. After creating a piece of content that you’re happy with, you might want to duplicate it for use as a template. You can duplicate content with just one click in Contentful. It’s a simple as going to Actions in your right-hand corner and clicking duplicate from the dropdown. When you’re in the grips of a “I need help now!” panic, it helps to be able to quickly communicate your issues to the support team. An easy way to do this with Contentful is to provide the support team with the ID of the entry you’re struggling with. That way they can navigate there quickly and fix the issue. You can find your entry ID by going to the right-hand corner of the Contentful web app and clicking info. 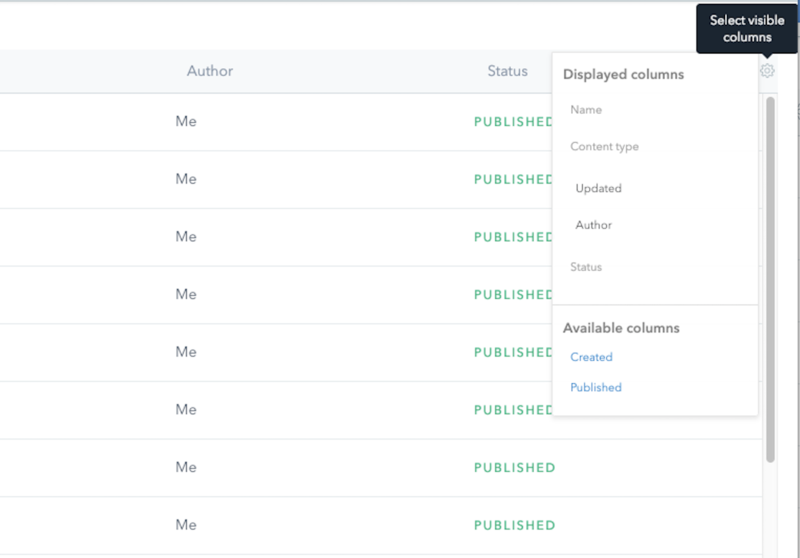 You can choose, order, rearrange and delete columns on your content dashboard. It’s completely customizable for what you need and use. Just like your dock or menu on your laptop, clearing out information that you don’t need declutters and refines your workflow. To do so, click on the settings wheel to the right-hand side of your columns and choose from the available columns highlighted in blue. You can remove the columns you don’t need by clicking the blue x that appears next to your displayed columns. Reorder the columns by clicking and dragging to your order of preference. Views are a great way to increase your productivity by saving and categorizing your favourite content and media search results. To create a view, simply sort your content or media using the search bar. Once you have your required list of content, click save view to the right of your search bar. It will ask you to give your saved view a name. Once you have multiple saved views, you can organise them into folders. You can view both your saved views and your folders in the My Views panel on the left-hand side. Views are highly adaptable to your workflow. The key is to make note of the content you access every day, or at least regularly, and create your views around that.